Much to the chagrin of many new parents (including myself), their newborns do not come with an instruction manual! There is a rather steep learning curve when it comes to the activities that are right for your little bundle of joy. One such, rather unappreciated, activity is floor time. Your baby needs ample floor time, especially early on for the proper development including neck strength, core strength, and even visual development. While having a lot of floor time can be a difficult thing to achieve for busy parents, some tools can help you achieve this without you having to monitor your baby continuously. One such great tool at a busy parent’s disposal is one of the various iterations of the Graco pack-n-play Playard. It is a great little tool that you can carry around in the house or even outside. It is a playpen that you can take with you wherever you go. It allows the baby to have ample floor time while you can get some work done. Although such devices are great, there is one aspect that you must be careful about when using them- the mattress. Most of these devices have a rather thin mattress that covers the floor. If the mattress is not good, the baby will not be comfortable playing in the playpen, and the whole exercise will be a giant waste of time. What you need is a firm but soft mattress that covers the floor of these playpens. The mattresses that can be used in playpens like these are sometimes referred to as pack-n-play mattresses as well. As you will shortly see, these mattresses are different from your regular crib mattresses in that they have a rather custom size and a firmer texture. There are a ton of options on the market, and it is important that you know how to pick the best of them. After all, the safety of your baby is at stake here. Your child is going to spend a lot of time on this mattress, and hence, both the quality and comfort are important. So, let’s get going and find the best pack-n-play mattresses on the market. Is a pack-n-play mattress different from a crib mattress? What to look for in a pack-n-play mattress? Another entry from the Dream On Me brand, this 3-inch play yard mattress deserves a special mention. Made with quality material, it is one of the most comfortable play yard mattress that you can buy. It features a softer texture and rounded edges. The mattress is made from 90% foam and 10% vinyl material that ensures the waterproofing as resists bacterial and fungal growth. It is one of the easiest mattresses to clean as well. All the material that is used in the construction is lead and phthalate-free. The vinyl cover for this mattress is also quite comfortable. The mattress is hypoallergenic and easy to carry as well. If you are looking for an all round playpen mattress, then this Dream On Me is a mattress that you should check out. There are absolutely no downsides with this mattress. I rarely say this, but this mattress is truly flawless! Dream On Me is one of the best bedding brands for children that I have come across. They have quality products that are thoroughly tested, and I just love them. So, when I heard about a pack-n-play mattress designed by Dream on Me, I had big hopes. And let me start off by saying that I was not disappointed even a bit. The pack-n-play mattress is one of the best that you can buy on the market. It is a three-inch thick mattress that is designed to fit in a standard pack ‘ play playpen. It is the right size and right thickness. The mattress is made from a composite material consisting of 10% vinyl and 90% foam. It is firm and yet very comfortable. One of the best things about this mattress is the waterproof lock stitched binding that prevents mold, mildew, and odors from seeping into the foam core of the mattress. It also comes with a reinforced waterproof cover that prevents any accidents and spills. Another thing that I love about this mattress is that it comes in compact packaging that makes it easy to transport. The weight of the mattress is just about 3 pounds, and it can support a baby up to 25 pounds of weight. Overall, it is a great mattress that receives my full endorsement. Sproutwise is a name that is frequently associated with some quality bedding material for toddlers and babies. The pack-n-play mattress from Sproutwise is a great folding pack-n-play mattress that has quality written all over it. Designed to be carried easily wherever you go, the mattress offers a great bang for your buck. One of the best features of the mattress is that it is made from a 100% organic cotton material. Although the mattress is waterproof, the outer liner of the mattress is soft to touch and hypoallergenic. The outer mattress cover is made from a composite lates-cotton material that prevents water and odors to seep inside the core of the mattress. It is the extremely comfortable mattress that can be used in the playpen or on the floor as well. My daughter loves this mattress a lot, and I must say, it is one of the better pack-n-play mattresses on the market. If you are looking for a pack-n-play mattress that is easy to fold and carry, then the Milliard Mattress is the mattress for you. It features a three fold design that allows easy folding of the mattress so that it is incredibly easy to carry around. The mattress has rounded edges that allow for a perfect fit in almost any pack-n-play style playpen. The mattress is 1.5 inches thick which is the perfect thickness for a pack-n-play type mattress. One of the surprising features of this mattress is how soft it is considering that it is also a waterproof mattress. Most of the waterproof mattresses that I have tried for my daughter tend to be on the stiffer side, but this one is quite soft compared to those. Although some parents may find it a bit too soft, others may love the way it feels. From my personal experience, the mattress is soft enough for my daughter to play on and even take naps. The mattress is shipped with a washable polyester cover that allows for easy folding. As a bonus, the mattress comes in with a carrying bag that has room for carrying the mattress and an additional blanket as well. The only issue with this mattress is that as it is a foldable mattress, there can be a small gap between the folds. 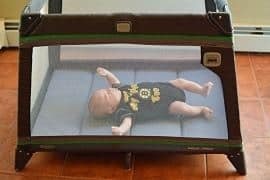 Although it is not a big deal if you are planning on using it in a pack-n-play playpen, if you are using it on floor, then it may be an issue. Designed to be carried everywhere you go, the MamaDoo mattress is one of the sleekest looking mattresses that you can buy for a playpen. The unique ‘firm but comfortable’ texture allows for comfortable naps as well as some quality floor time. The mattress folds into three section for easy carrying around. One of the best features of the mattress has to be the versatility. It can be used for tummy time, napping as well as on a toddler bench. All the material used in the mattress are thoroughly tested for toxic chemicals including lead and heavy metals. The mattress comes with a transparent carrying case that makes carrying it around a breeze. It comes in three different colors as well. The MamaDoo mattress is one of my favorite pack-n-play mattresses as it is an incredibly comfortable mattress that is very easy to carry around. Do check this one out. The only issue that I have with this mattress is the price. But as with most things, you get what you pay for, and with the MamaDoo mattress, you get the sheer quality that doesn’t come cheap! If you are wondering whether the pack-n-play mattress is the same as a crib mattress, let me help you make this important distinction. You see, the biggest difference between a crib mattress and a pack-n-play mattress is the size. The pack-n-play mattresses are smaller compared to most crib mattresses. While most crib mattresses measure 27.25 inches wide and about 51 inches wide, the pack-n-play mattresses measure 25.5 inches wide and 37.5 inches long. Also, the pack-n-play mattresses are thinner compared to most crib mattresses as well. A standard pack-n-play mattress is about 1-3 inches thick while a crib mattress is about 5 inches thick. As you can see, there is a huge size difference between the crib and pack-n-play mattresses. Hence, it is important that you are purchasing a mattress that is designed specifically for pack-n-play type devices. If the mattress won’t fit properly, the chances of the baby injuring himself/herself increase tremendously and you don’t want that. Furthermore, the extra thick crib mattresses are not designed to allow the babies have an excellent floor time experience in the first place. Mattresses designed specifically for a pack-n-play type device allow for a better floor time experience and hence are better suited for playpens. As I alluded to before, there are a ton of options when it comes to pack-n-play mattresses. Although some of these options are great, some others are not. If you don’t know what to look for, the chances of you picking up the worst increase dramatically. Hence, it is important that you know exactly which features to look for while purchasing a pack-n-play mattress. Here are some of the features that are the most important to look for in a pack-n-play mattress. The material of construction is also an important thing to look for while purchasing a pack-n-play mattress. Most playpen mattresses are made from a firm foam substance that provides adequate support and comfort. Some of the playpen mattresses are also lined with water resistant material for easy cleaning. The most important thing to note is whether the material that is used in the construction of these mattresses is safe or not. Make sure that you are looking for material that is BPA and Phthalate-free. Some of the best mattresses are designed with materials that are hypoallergenic as well. If your baby has allergies, you can give these mattresses a try as well. The cover of most of these mattresses is made from some plastic material such as vinyl. Although the material is safe for use, make sure that it is free from potential toxic elements such as lead and other heavy metals. One of the biggest advantages of a pack-n-play is that you can carry it with you. If the mattress that you chose is too heavy, the portability of the playpen can be a real issue. Make sure that you are selecting a mattress that is light and yet offers a great comfort and protection. Trust me; a comfortable mattress does not have to be a thick and a heavy mattress as you will see in the detailed review section below. 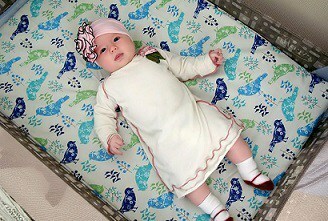 As we saw in the previous section, the size of a pack-n-play mattress differs significantly from the crib mattresses. Hence, it is essential that you pay close attention to the exact size of the mattress before you pick one for your playpen. As the pack-n-play mattresses are shorter and narrower than crib mattresses, you can’t use the crib mattresses in playpens. If you are not careful, you can easily pick the wrong mattress, and it can be a huge waste of time and money. Another important thing to note is that most playpen mattresses are thinner compared to the standard crib mattresses. They are designed to be thin as they allow a better opportunity for the baby to use the floor time effectively. 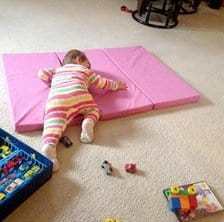 If the mattress is too fluffy, the baby won’t have an adequate floor time experience. Hence, make sure that you are not buying a pack-n-play mattress that is more than three inches thick. Although all the mattresses that I reviewed above are great, one brand edges past all others. Of course, I am talking about the Dream﻿﻿ On Me 3" Playard Mattress. It is one of the best pack-n-play mattresses that you can buy and checks almost all the marks. It is light, easy to carry with you, very comfortable and waterproof. If you are looking for a mattress that will offer the best bang for your buck, the Dream On Me 3" Playard Mattress is the way to go. If you found this article informative and helpful, please share it with your friends and family.